Aiming to maintain its ability to transmit a full line-up of services to the British and Irish markets, UK broadcaster Channel 4 has extended its satellite capacity agreement with SES for direct-to-home broadcast services. Mexican multimedia company Grupo Televisa has extended its contract for Intelsat?s satellite solutions. Covering five launches until 2027 and attributed with providing the operator with assured access to space with schedule flexibility at cost effective prices, Arianespace and Eutelsat have concluded a long-term multiple-launch service agreement. UAE satellite operator Yahsat and Hughes Network Systems are to jointly provide commercial Ka-band satellite broadband services across Africa, the Middle East and southwest Asia. In a bid to attract more users and do branding, the Internet service provider (ISP) ONEOTT iNTERTAINMENT, which offers its home broadband services under ONE Broadband and ONE Fiber, will soon launch free Wi-fi with unlimited data usage at 100 locations across Mumbai and Maharashtra. 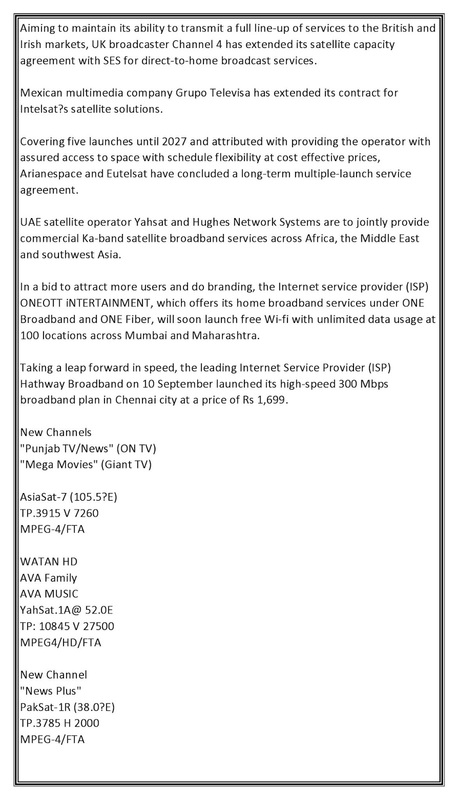 Taking a leap forward in speed, the leading Internet Service Provider (ISP) Hathway Broadband on 10 September launched its high-speed 300 Mbps broadband plan in Chennai city at a price of Rs 1,699.